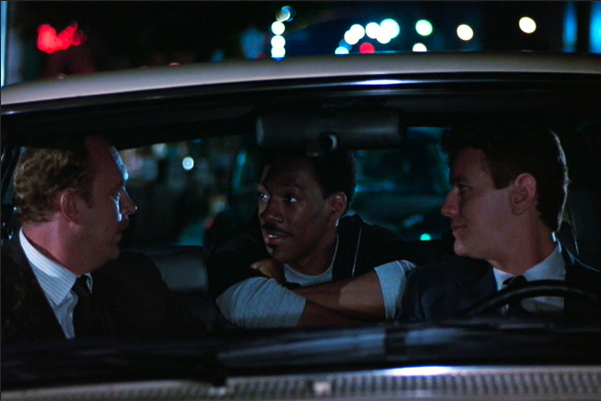 Eddie Murphy (as Detective Axel Foley) with his two sidekicks, played by Judge Reinhold (right) and John Ashton (left) in Beverly Hills Cop. Story: A Chicago cop goes to L.A in search of crooks and irritates the local authorities, but gets the baddies in the end. Review: Like the Fletch movies, this film features a puckish guy (Eddie Murphy) who skirts the rules and gets away with things because he’s tricky and lucky. His varyingly unwilling sidekicks are pretty funny too. For those who might be put off by Murphy’s more recent and highly sucky films, don’t worry. This, and the other Beverly Hills Cop movies, are very different. Recommended for: Fans of funny police/man against the machine movies. Content notes: (L, V, PG, C) – The dialogue consists largely of swear words and there are lots of bloody shootouts, but if you get the cussing-dubbed version I don’t think the violence would bother most 8-year-olds. Actually, this trilogy is my Mom’s favorite set of movies. Still, each kid is different so parents should watch it first and judge for themselves. This entry was posted in Review and tagged 80s, Action movie, Comedy, movie review, Movies. Bookmark the permalink.